Man I knew there was something evil with those fast food chains but this is ridiculous. 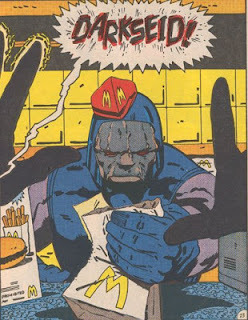 I mean I know that he is obssesed with the Anti-Life Equation*, but going as low as having his own fast food franchise to enslave us all? And making those things highly addictive? Darkseid. He truly dares all. Including preparing those burgers. *For those that don't know the ALE has the ability, once unleashed, to wipe all free will and make all sentient live mindless, agressive drones performing meaningless tasks and then sitting, watching noise in screens and eating precooked meals... wait a second. did anyone released the ALE in form of Reality TV?